If you think that Elance rules over the world of online freelancing with an iron fist, well, you’re kind of right. As of the writing of this sentence, Elance reports that freelancers have earned nearly $300,000,000 as they web designed, copy wrote, and virtual assisted their way to glory and riches. 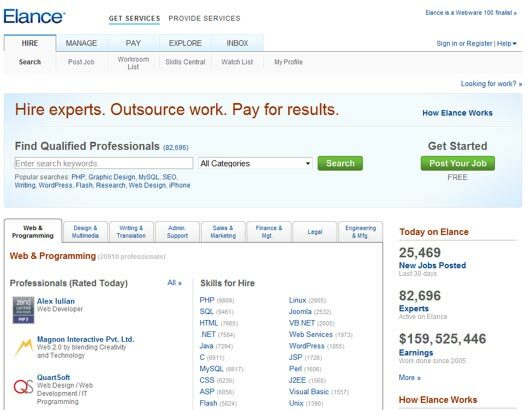 But is Elance really the best freelancing solution out there? Consider today’s challenger: oDesk.com, another Clickfire.com review alumnus and one of the favorite platforms for businesses who need quick work without any hassle. While the two sites have similar goals, it’s really the differences that separate them and give us the subject of today’s topic: which freelance web site delivers the goods and which gets outshined? Let’s tackle this bit-by-bit. Like the judge of Iron Chef considering “taste,” our first attention needs to turn to price: how expensive is it to work (and hire) at each of these respective sites? For, let’s consider Elance. Elance uses a relatively simple system for work providers: you can purchase a certain amount of project “bids” each month. These bids are your marketing currency. The larger a project is, the more bids it will take require simply to send your potential client an introduction and project proposal. In Elance ancient times, these bids were month-to-month, but recent ugprades allow you to roll unused bids from the previous month over to the current month. And while it used to be that the big-budget projects required astronomical amounts of bids, Elance has tamed their demands. One note: expect to pay regular 8% fees to Elance for the projects you win, too. As for those doing the hiring: Elance is cheap and easy, with a minimum project fee of $50 – or less if you pay hourly. What about oDesk? The pricing news is more cheerful. You can be listed for free on oDesk (not so on Elance, which requires the subscription to really get noticed), but there are other issues – for example, you won’t receive upfront payment from the people who hire you. By comparison, Elance’s Escrow service is a nearly-bulletproof way to ensure you get paid. In comparison to Elance’s pay-for-bids system, oDesk gives you a “quota” of job applications, based on issues like your job performance (and client feedback) and whether you’ve taken the oDesk test yet. Conclusion: oDesk wins in the battle for price, although building up a “quota” can be a little more frustrating than simply paying for a higher amount of job applications. Keep in mind that both sites take substantial (think 5-15%) fees out of the money you earn. As a regular Elancer myself – who also maintains an account at oDesk, if you question my objectivity – I’ve had a number of clients who have told me that the Elance interface can be confusing. But, really, it’s not too bad, especially after you give that first project bid or work posting a try. Elance is also constantly updating their interface while oDesk’s has remained relatively unchanged for some time. If you’re a freelancer using Elance, it’s not hard to search for jobs in your category and narrow down job postings based on your criteria. You can browse by project size, niche categories, and other features like whether or not the client wants to use “Escrow” payment or not. New project acquisition is relatively easy if you can put together a good proposal and a good portfolio. As for oDesk, you won’t find things get more complicated. Just click over to “Find Jobs” (if only it were that easy in the off-web world) and you can search through jobs with relative ease. Just click “Apply” and you’re ready to use some of your hard-earned quote to generate some new business. Conclusion: About even. oDesk boasts many of the same browsing features as Elance, so it will be up to you to decide which site has the higher-quality projects to sift through. We’ve established that both sites will take fees out of what you earn. So which site gives you a little something for the trouble: a better payment and transaction system? If you’re an employer who doesn’t like paying in escrow, you can opt not to do so, though you may run into some trouble if you have problems finding proposals from people who would rather make sure their money is waiting for them. Both sites handle the basics: depositing money into your bank accounts is not a major challenge on either site. Advantage: Elance. You have to love the escrow service. While there are other elements to consider, these three criteria can at least be applied to both work providers and people looking to hire. So which site reigns supreme? In my opinion, Elance gets it. Though you’ll find more cost for the membership and the bids, it’s not hard to earn your investment back. You’ll also find that the Escrow and relatively lower transaction fees more than make up for what you’re losing on the front end. Both sites, however, should be in every freelancer’s arsenal. I know I have accounts at both sites. And if you’re ever going to become a professional freelancer, both sites could be considered great ways to make contacts with clients – and you can always transfer them to your own payment system if you want to avoid being stuck with the fees. oDesk is not a bad introduction to the world of freelancing for the beginners who want to find work without bringing out the credit card, but in our opinion, Elance is where you want to be. James, we are looking at this aspect again and will post a response this week or next. Reagan, Clickfire does not accept paid reviews. Hey guys – I’m submitting my response to these concerns to Emory today. Thanks for taking the time to point out a weakness in the review. Hopefully you’ll appreciate the additional research I did on the issue of oDesk payments. Checking out oDesk. They have a $50 affiliate program which is not bad to take the site for a test spin. how does the fixed price payment guarantee work at elance? since in odesk, fix price jobs are not guaranteed to be payed, how would I know if elance is better when it comes to assurance of paying fix price jobs? With Elance, the buyer escrows the fixed amount of funds. Once the project is complete, the funds are expected to be released. i think odesk may be good for buyers, but if you are quality provider, you shouldn’t move, you can’t win your bread and butter with 2-3$ for long hours. I was interviewed by one client, asking me research 200 websites for $5…what the heck? i denied. Same with some other interviews too, they want to get the job only few hours..which is hours long….I can’t do that…i’d rather do a labor job, i can get more than that. All your quality service provider STAY AWAY from oDESK, a very cheap place not for the quality people. I think both sites are great since they provide legitimate work at home opportunities for people. I tried elance but I found out that their tracker for ubuntu is still awaiting moderation. Although some people may consider that odesk has lower rates, it still provide some people a source of extra income. Been working with oDesk for 2 years now. great to find a “regular” employment from a US employer. What’s great with oDesk is their weekly pay schedule for hourly projects. And the 10% fee is being paid by the employer and not from the provider’s pay. I did 2 projects with Elance prior to joining oDesk and even if they have the escrow system, it’s still up to the vendor when to release the payment. So for my part, completed the assignment for 2 weeks already and the buyer was gone “fishing” I think so no payment for me for several weeks. And the other buyer just lost into oblivion after 2 payments and 1 pending but completed milestones. Based on what you say and my own experience, I am wondering if providers might prefer oDesk and buyers Elance. I have been working as an oDesk freelancer for 11 months and as an Elance freelancer for about 6 months. I have to say that I enjoy working with both, but recently, the budget disparity between the two sites has made me spend a lot more time on Elance than on oDesk. The difference is appalling. I’m being paid $40 to write one original 500-word article on Elance and being offered $23 to write 8 articles on oDesk. The lowballing is becoming unbearable. I still do hourly work on oDesk when someone accepts my rate, which is more than fair, but still employees want to pay less. For fixed-price work, I tend to stay with Elance. I’ve had a hell of a time just paying my freelancers through ODesk. Their payments system is very buggy and accounts are often suspended without good reason. 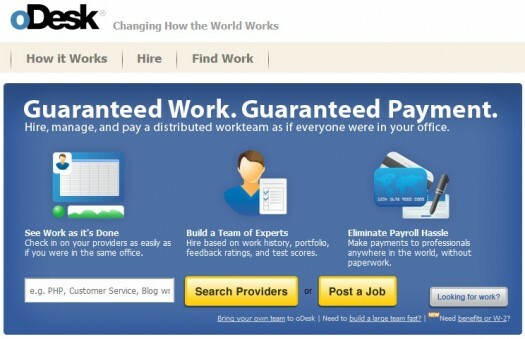 So don’t necessarily expect to be paid fast through ODesk. As an employer, I’m switching to elance so I can be sure the people working with me are paid on time and I don’t have to constantly talk to support just to get them paid. I can tell you that Elance makes it very easy to pay. Never had any problems in that department. I’ve been an Elance contractor for 6 months. Perhaps 5% of the jobs we bid on actually get awarded. The others fade into oblivion. My guess is that if you post a job and you don’t get your 100 copyscape-proof articles for 2 cents each, you drop your job posting. Elance should really do something about this because it causes contractors to spend credits to bid, and then those credits are never refunded if the job doesn’t get awarded. Elance says employers get 90 days to select a contractor, but they never do. My new pet peeve is the people who post their job for more than $10,000 in value, when really it’s writing 100 articles a day for 10 cents each for 3 years. Who is going to work for those wages? Would the employer take those wages at their day job? estelle, were you able to get very many ratings? I’ve been guilty of not awarding jobs on occasions but it’s usually when there aren’t enough bids or the bids don’t have enough ratings data. Really nicely written and informative. Thanks. How ever wanted more information on the job quota that i can apply. In odesk at a time one can apply in 20 jobs. What about elancer? Elancer to me is confusing as i cant yet find out how many jobs i am applying and what is my limit ? Hi Tanbir! On Elance, you get “connects”, which are like tokens you can use to apply to jobs. You get 15 connects in the basic (free) membership plan, but you have the option to add connects to your free membership by paying separately or you can upgrade your membership to a paid one and get at least 30 connects a month (depending on the membership). On paid memberships, if you don’t use all your connects in one month, they will roll over to the next month. Elance was a bad work experience, they didn’t support providers, they’re doing their own business, they suspend/terminate providers with great profiles without warning.